Introducing the next stage in the evolution of the guitar game. Rocksmith, the first and only game where you can plug any real guitar into your console and actually learn while you play. Nothing plastic. Nothing fake. Just the most authentic guitar experience in music gaming. By plugging into your console, you'll develop real skills and real styles while playing absolutely real music. Featuring gameplay that automatically adjusts to your personal ability and innovative game design that makes playing music visually intuitive, Rocksmith will engage experienced musicians as well as those who have never picked up a guitar in their life. You'll unlock mini games to hone specific skills. You'll be able to choose from a large catalog of songs in different styles. And you'll experience it all with an honest-to-goodness guitar. Nothing compares to playing a real guitar. Except playing Rocksmith. 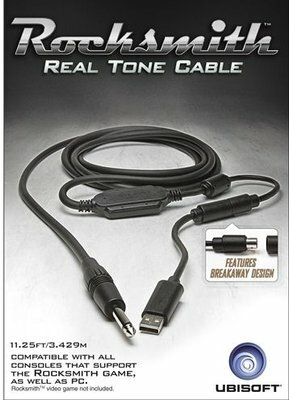 When we say any guitar we mean any guitar: Whether it's the guitar sitting in your attic, your cherished faithful steed, or the guitar you have yet to buy, Rocksmith lets you plug any guitar into your console or computer. Electric guitar or electro-acoustic one, as long as it has a jack, you can play. No jack on your guitar? Head down to your local music store, get an inexpensive pickup, and problem solved. Real time adjustment levels: from beginner to stage animal: You love a challenge, but hate being overwhelmed. Rocksmith understands that. With addicting gameplay that continuously adapts to your personal skill level, you will automatically progress from single notes to complex chords at your own pace. Eventually you'll be playing 100% of the real guitar parts from the songs and the game will challenge you to step away from the notes on the screen and play songs by memory. Imagine that. A game that'll get you stage ready. Bursting with hits: Rocksmith includes an amazing library of international songs of many genres. Whether you fancy classic rock bands such as The Rolling Stones, The Cure, Lynyrd Skynyrd or if you're more into the latest hits of bands like The Strokes, Muse, Sigur Rós we've got you covered. There's always a way to develop your guitar skills and overcome your difficulties: Having troubles with the solo of your favorite song? The riff-repeater option is your savior. It isolates the part of your choice of the song, and let you repeat it over and over ... until you eventually ace it! Want to learn chords? Improve scales? For all of these and more, there's a specific mini-game that we'll help you get it by turning your guitar into a controller! Turn your TV or computer into an amplifier: No needs for an amplifier anymore, with Rocksmith your TV or your computer is your amplifier and will let you play with loads of in-game pedals, amplifiers and cabinets. String pedals together with nearly infinite combinations and tweak your sound until you're satisfied.